B. 527 x 632 mm., S. 620 x 750 mm. Picaso and the Linocut is an outstanding example of an artist re-inventing a medium and making it his own. 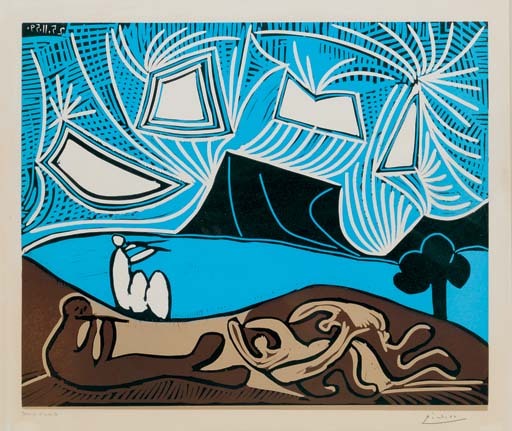 Unlike with techniques such as etching and lithography, no other artist had experimented much with the linocut before Picasso's exhaustive exploration of its creative possibilities between 1958 and 1963. His first major multi-coloured linocut was the Buste de Femme d'Après Cranach (lot 433). Inspired by a postcard sent to him by D.-H.Kahnweiler, Picasso's resultant re-interpretation of the painting is a stunning and elegant masterwork. However, printing each of the six colour blocks from a separate piece of linoleum proved extremely laborious and time-consuming. As was typical of Picasso when faced with technical difficulties, he relished the challenge and in a bold move completely re-invented the technique. Rather than using separate blocks for each colour, he printed from just one; the so-called 'reduction' method where the uncarved block was printed in one flat colour, and then cut and printed in each successive colour. Whilst making the task of registration much simpler, this new technique required tremendous foresight to know how each change in the block would affect the composition. The following 32 lots of his linocuts illustrate how Picasso relished working in the medium; the physical act of cutting and slicing the linoleum produced fluid, dynamic compositions which ideally suited his style and chosen subject matter and he produced some of his best known and most successful images using the linocut technique.